Perennial, tufted grass from fibrous roots, smooth to densely soft-hairy; stems 20-50 (60) cm tall. 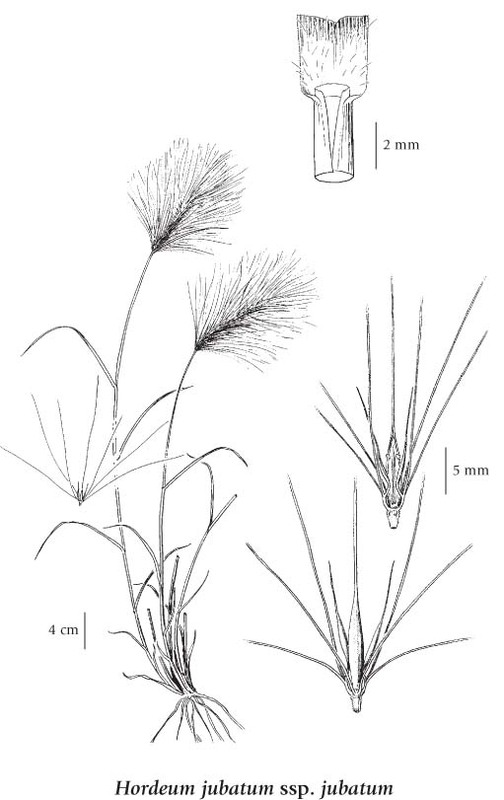 Sheaths open; blades 2-4 (5) mm wide, sparsely hairy just above the ligules; ear-shaped lobes usually present on at least some leaf-bases, barely 0.5 mm long; ligules 0.2-0.6 mm long, blunt, more or less entire. Inflorescence a spike, 5-10 cm long (including awns) and almost as wide at maturity, the rachis disarticulating; central spikelets unstalked, the lateral ones short-stalked, the stalks curved, stiff-hairy, about 1-1.5 mm long; central spikelet glumes awnlike, (11) 20-90 mm long, the awns of the lateral spikelet glumes often as long as those of the central spikelets; central spikelet lemmas with awns nearly as long as the glumes, ultimately usually more or less broadly spreading, the lateral spikelet florets sterile, rudimentary to nearly as large as those of the central spikelets, then with functional anthers; anthers 1-1.5 mm long. Moist to dry, often alkaline, lakeshores, meadows, roadsides and waste places in the lowland, steppe and montane zones; frequent in S BC, infrequent northward; circumpolar, N to AK, YT, and NT, E to NF and S to SC, TN, AR, TX, NM, AZ, MX and CA; Eurasia, S America. 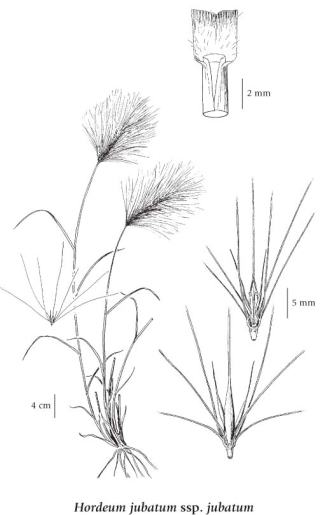 Hordeum jubatum var. caespitosum (Scribn. ex Pammel) Hitchc.